To calculate driving resistance, it's very important to find out the size of the front area. The evaluation of the photo results in 2.5 m². The ground clearance is 15cm in the area of the battery. BYD is a producer taking green tech for tumorrow honest, really creates. Driving cars with 100% electric power from sun and wind instead of insignificant less consumption. The 380V 100A three-phase current quick charging column and the BYD E6 behind symbolize the begin of the end of the internal combustion engine. An age ends for luck. Fast charging is only necessary at long range travels, continuous use as a cab or no power outlet at the parking lot. This instructions are on the fast charging cabinet left from the screen. BYD comes to Europe! The charging cabinet can be used in French, German, Englisch, Spanish and Italian. That ist customer service, I missed 2005 very much at a gasoline station in San Marino. After the language selection, the BYD fast charging cabinet demands the selection of payment method. IC-card or credit card can be chosen. Right from the quick charging socket is the covering for a 230V 16A socket. This to compare the size of the 2 sockets. 400 Volt 100 Ampere three phase current are enough for 69 kW. The plug for this power is much bigger than 230V household plugs. Typical minvan comfort is in the passenger room. The details match cars with internal combustion engines in the same price class. Comfortable 38cm to the front seat have the passengers in th fond. My first impression from BYD at the Geneva car salon 2008 was ''When the sun rises in the east, the stars dim''. It seems that BYD made also a strong impression at Mercedes. The main part of the luaggage department is 103 cm width, 80 cm from the tailgate to the back and 37 cm height to the covering. That are around 300 litre. BYD started 1995 as a producer for cell phone batteries. BYD purchased 2003 a car factory. Here the battery from my Samsung Galaxy Spica in front of the huge BYD battery. In the area of the front seats is the battery a little bit higher. The total size is 175 cm length, 95 cm width and 30 cm height, as far as it was possible to measure accurate. 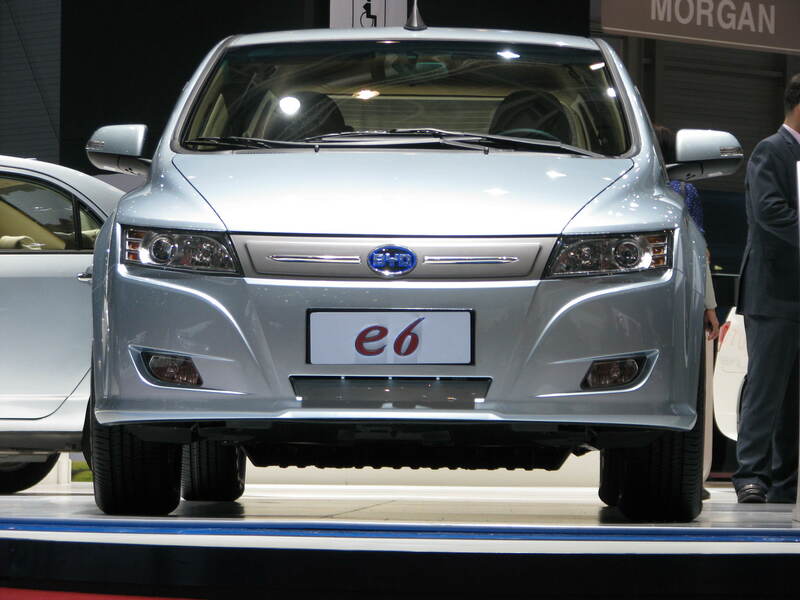 Close up from the BYD logo in front of the e6 electric car. Picture from BYD e6 electric car from right behind. Close up from the right part of the rear. A second electric engine makes also the rear wheels to driving wheels. The windshield wipers at the BYD e6 are asymetric. A long and a short wiper. Here a close up from the right headlight. Presumably engine controller and battery charging arre here to find. Right in the photo a 30 Ah 12 V lead acid battery. What does a 12V lead acid battery in an electric car? It's that the light does not run short when the DC-DC from the big battery to 12V fails. In this tire dimesion are tires for motor cars and tires for vans optimized for low rolling resistance. Close up photo from the driver door. On the side of the dashboard is an air opening, on this are the rubber seals of the front door. The air is direct blown to the window in the area of the side mirror. Close up from the side mirror. It seems to be built in a flashlight to indicate change of direction. Coherent with the price is the dashboard of the BYD e6. All what You would expect in an ICE car of the same price class. On the steering wheel are left and right 2 function groups of switches. More details on the close up photos on the next pages. No parking brake by hand, but by a pedal has the BYD E6. Also the sun visor of the driver seat has a mirror lighted up with a LED lamp. On this label next to a switch in the left back door of a BYD E6 is sure written ''Child saefty'' in Chinese.